This is a sponsored conversation written by me on behalf of ADA Foundation. The opinions and text are all mine. Bringing a child into the world comes with a long to-do list. Once they arrive, that list gets longer and they don’t even bring an instruction manual with them. No manual means we wing it with advice from our parents and friends, and listening to our gut. As we go through the different levels of parenting we realize there are a number of things we don’t know. Maybe even more shocking is the realization that our parents also didn’t know these things and were winging it themselves. One benefit we have that our parents didn’t are online resources like Give Kids A Smile®, that help us stay informed on keeping our kids healthy. Thinking back to having my first child, there were a lot of things I didn’t know about dental health for tiny smiles. I didn’t know what to do before baby teeth came in. When I had my first child, I would have had no idea to clean her gums if no one had told me. I knew baby teeth are important for helping a child eat, speak, and smile, but I hadn’t thought about the gums before being a mom. 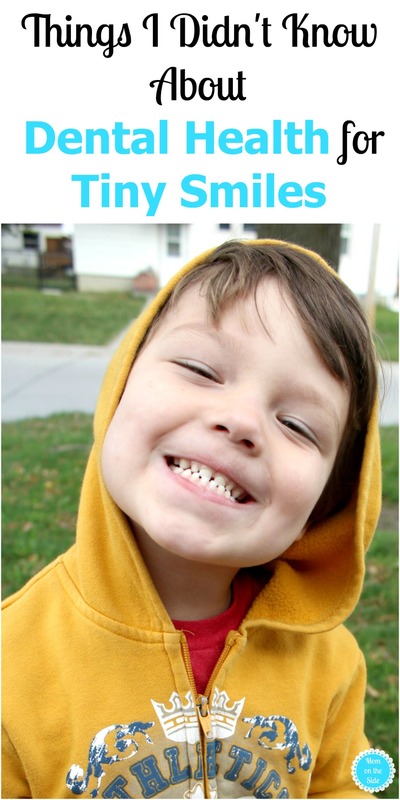 Tiny Smiles, a free education program to help promote the importance of dental health in children ages 0 (birth) to 5, recommends using a damp, soft washcloth to clean the gums. That’s what we did for all four of our children until their first teeth came and then we moved to a baby toothbrush with just a smear of fluoride toothpaste. I didn’t know it would be so hard to get them to brush. For me, brushing teeth was easier when those first teeth start coming in around 6-13 months because, for the most part, they just lie in your lap and let you clean away. Toddlers though, those three-year-olds with mouths full of 20 teeth, yeah they like to test their defiance at the bathroom sink. For two minutes twice a day at that. Making teeth brushing fun really helped my kids look forward to brushing. There are fun videos to watch at 2min2x.org and we also use a sticker chart to encourage the twins to brush morning and night. 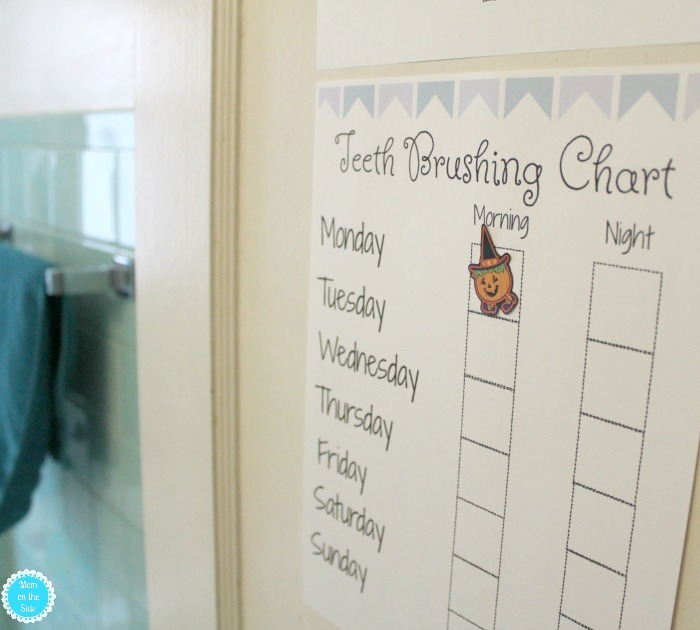 Those things have really helped, and if you want a tooth brushing chart for your kids, you can print it here! I didn’t know when kids should start flossing. Honestly, I didn’t know kids needed to floss at all until our first dentist visit with our oldest 15 years ago. I’ve always flossed my teeth for as long as I can remember but didn’t realize when at least two teeth start to touch you need to clean between them. Fear of hurting their tiny gums always stopped me, but now I know how important flossing is to get rid of those “sugar bugs” and help children keep their baby teeth. I didn’t know cavities were so common in kids. Until I took my first child to the dentist, I had no idea kids could get cavities after their first tooth appeared and that preventing cavities begins during pregnancy. Thankfully, only one of my four kids has had a cavity so far. That’s actually right on par with a National Health and Nutrition Examination Survey* that found nearly one in four children under the age of 5 already has cavities. A disproportionate share of tooth decay, around 80%, is suffered by our poorest children. 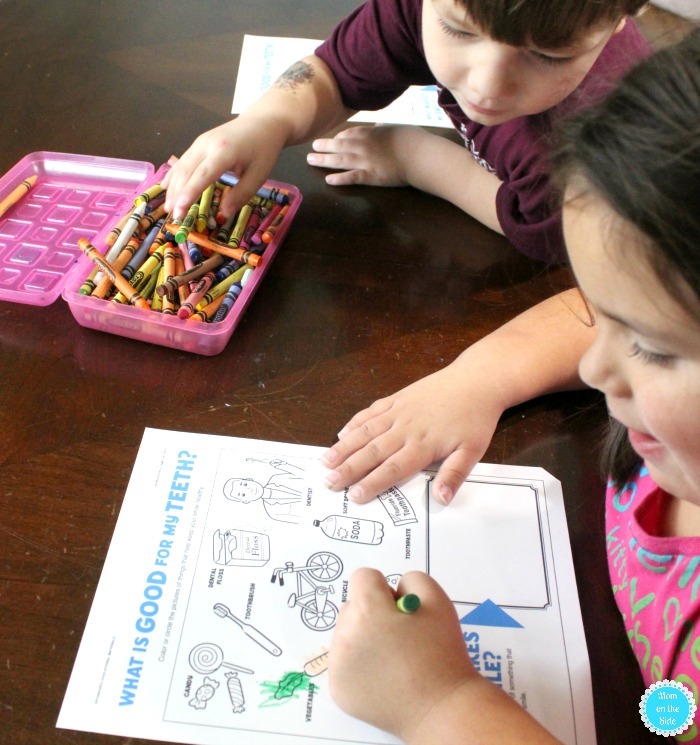 Visit the Tiny Smiles site to learn more about preventing cavities, along with some fun printables like “What is good for my teeth?” that helps little kids learn how to keep their teeth healthy. I didn’t know how eager they would be to lose teeth! Being a kid who’s had a visit or two from the tooth fairy, I know how exciting losing teeth is. What I don’t remember is being so eager to lose them. Are your kids that way? Maybe it’s having older siblings but the twins REALLY want their teeth to fall out. Several times a week they ask if it’s almost time and I continually remind them it’s not. I mean, we’re still working on spitting out all the toothpaste instead of swallowing, which happens around age 6 in case you were wondering too (the ADA recommends using a smear of toothpaste the size of a grain of rice for kids 0-3, and a pea-sized amount for kids older than 3). That’s the same age they could begin to lose teeth so it’s not too far off for us. 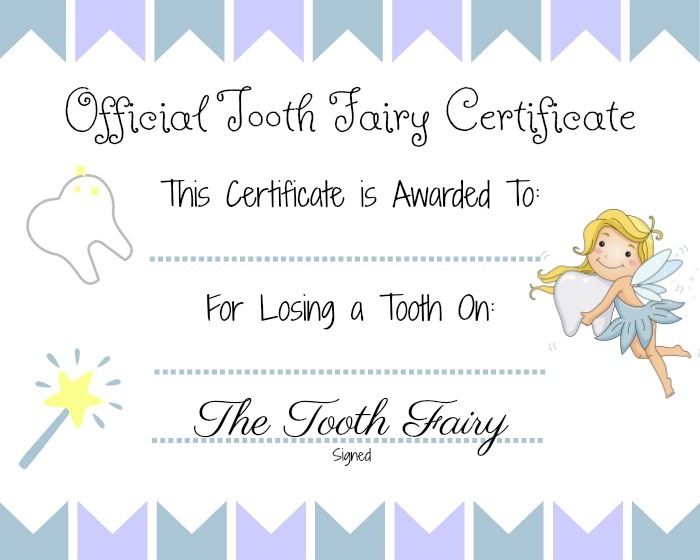 In lieu of the excitement, I created a Tooth Fairy Certificate Printable to give them, and you can print some to give your kids as well! I know I can’t be the only one who didn’t know things about dental health for tiny smiles, so hopefully, my sharing helped you. If you are welcoming your first child into the world soon, or just want to make sure you’re doing everything to keep your child’s teeth healthy, visit Tiny Smiles. It is a great resource for learning more about oral health for young kids, and has some fun printables too! *Source: Dye BA, Thornton-Evans G, Li X, Iafolla TJ. Dental caries and sealant prevalence in children and adolescents in the United States, 2011–2012. NCHS data brief, no 191. Hyattsville, MD: National Center for Health Statistics. 2015. My kid tried to pull out his tooth yesterday because he thought it was ready! He regretted that decision after! LOL! They LOVE to pull their teeth out!